Chicken Tortilla Soup is one of my favorites. It’s a very easy recipe and is delicious. My favorite part is the layer of chips and melted cheese on top of the bowl of soup, but the whole thing is a special treat. This recipe for chicken tortilla soup begins with ground or chopped chicken that is sautéed with onions, garlic, carrots, and celery. The mixture is combined with tomatoes with green chilies, beans, corn, broth, and spices before being simmered until the flavors are fully combined. 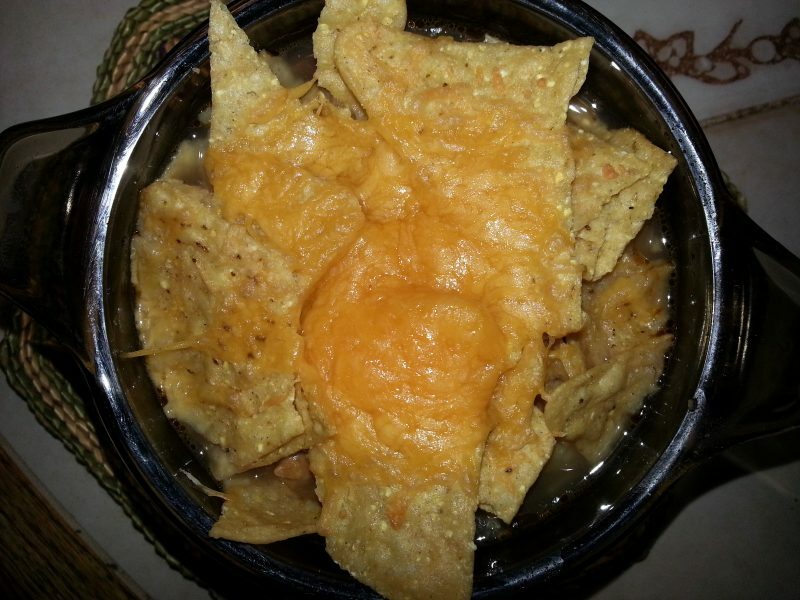 The soup is ladled into oven safe bowls and topped with tortilla chips and shredded cheese before being popped into the oven (or under the broiler depending upon the type of bowls you are using) to melt the cheese. You can even melt the cheese on your chicken tortilla soup in the microwave if you don’t have oven safe bowls. This recipe is simple and delicious. It’s a hearty and filling meal when the chicken tortilla soup is paired with a side salad. Here’s the printable recipe. 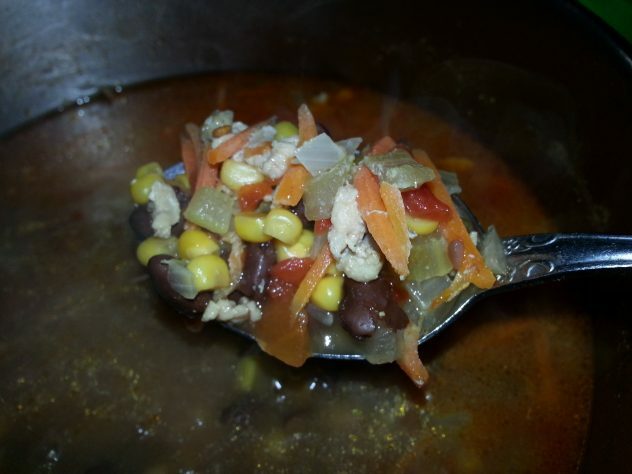 Give our recipe for chicken tortilla soup a try a try and let us know what you think by leaving a comment below. 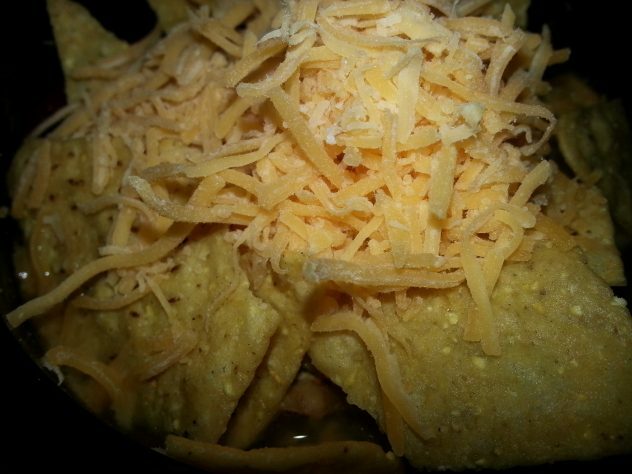 A simple chicken soup topped with tortilla chips and shredded cheese makes a delicious dinner. We love this served with a side salad. Cook's Note: If you don't have oven proof bowls, use microwave safe ones. Pop the cheese topped bowl of soup into the microwave to melt the cheese. Total cost of recipe is $5.55 or about 93 cents per serving. Heat oil in a 4-6 quart pot. Add onion, chicken, and garlic and saute for a few minutes until onion begins to become translucent. Add celery and onions to pan and continue to saute until vegetables begin to release their liquid. Add broth, black beans, corn, and tomatoes and stir to mix well. Add chili powder and cumin, stirring to incorporate spices into the soup. Bring pot to a full rolling boil. Once boiling, reduce heat and simmer for 15 minutes. Add chopped cilantro and allow to simmer for 5 more minutes. Squeeze a wedge of lime into the bowl (optional). 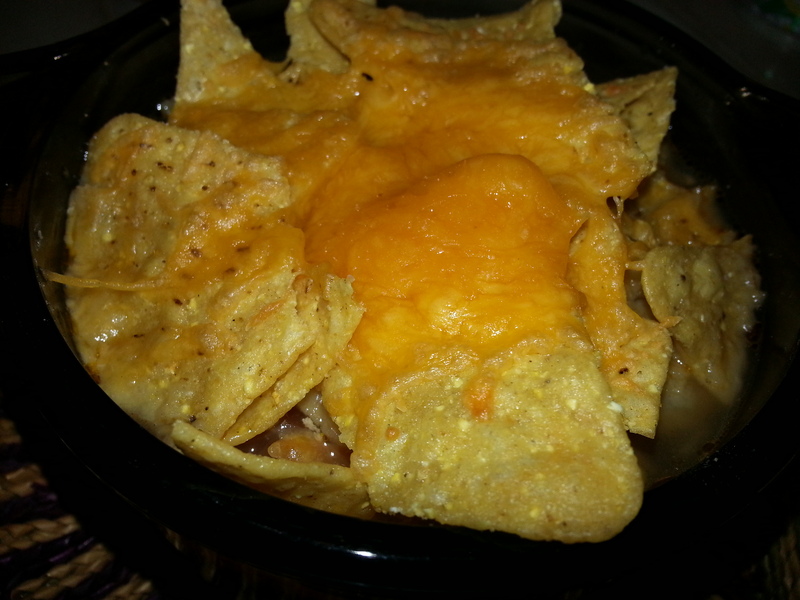 Top soup with tortilla chips and shredded cheese and place in the oven for 5-10 minutes until cheese is melted. 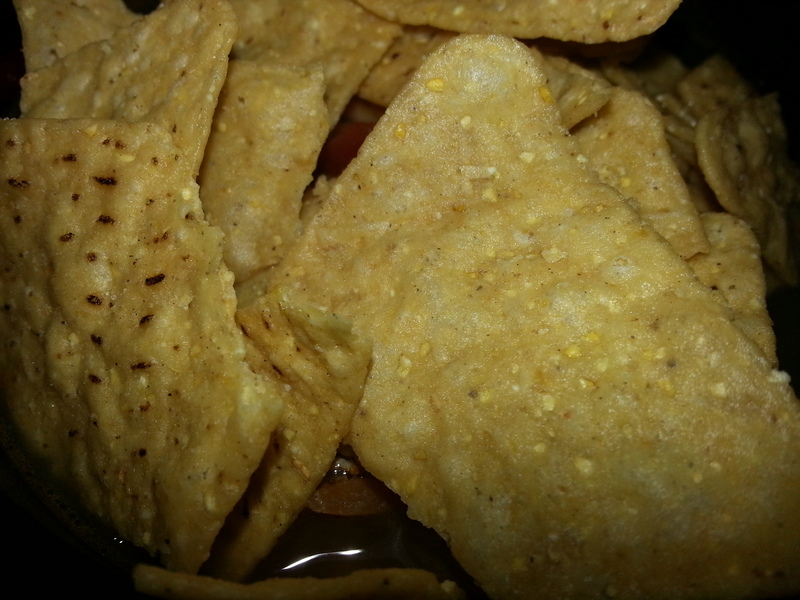 Nutrition information is for 1 1/2 cups of soup without corn chips and cheese on top. Nothing beats a warm tortilla soup in this weather. I love the cheese and the black beans in there and the smoky cumin flavors too. I agree with you, Veena. Having gooey melted cheese on top of a bowl of steaming soup is pure heaven, especially when it’s cold outside.